Great Guides, Food, Scenery, Rapids and Above All GREAT FUN! 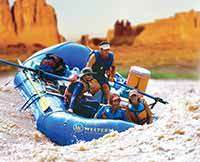 As someone who enjoys all forms of river rafting this one is the best! The guides were personable, helpful, knowledgeable and entertaining. The meals would be considered extraordinary anywhere. Bananas Foster with real ice cream on the 3rd night ...really! The other travelers were interesting and we had a good mix of ages. The scenery was some of the best in the Southwest. Even in low water, the rapids were exciting. Have never had a better river rafting experience!